Not many people have instilled a social change like Dwayne Szot, an artist from northern Wisconsin. Dwayne Szot is far from a typical artist—he is an innovative artist who creates work that allows kids with disabilities to complete simple childhood activities. Despite the situation they’ve been given, Szot’s work enables kids with disabilities to paint, draw, blow bubbles, and more. For a kid like Madison, an 8 year old diagnosed with spinal muscular atrophy, Szot’s work has proven to be life changing. Inspired by his foster siblings with disabilities, Szot strives to help kids experience and enjoy life to it’s fullest all over the world. When Madison was first diagnosed with spinal muscular atrophy, her doctor didn’t know a whole lot about the genetic condition. She flat-out told Madison’s fearful parents that their baby wouldn’t make it to her 2nd birthday. “That was pretty tough,” Jennifer Miller-Smith, Madison’s mom, told The Huffington Post. Seven years later, while the second-grader relies on a wheelchair and faces the disease’s degenerative effects, Madison is “thriving,” her mom proudly shared. A lot of that is thanks to Dwayne Szot, an artist who has committed his career to inventing tools that enable kids with disabilities to paint, draw, blow bubbles –- pretty much do anything any typical child gets to do. Before Madison met Szot, an innovator based out of a small fishing town in northern Wisconsin, the 8-year-old often felt frustrated and helpless. While she wanted more than anything to play with her friends, she was often relegated to the sidelines due to her condition. SMA causes the body’s muscles to weaken over time, making it impossible to perform such simple tasks as flipping a switch. Those with SMA type 2, like Madison, will never be able to walk or stand up, according to the U.S. Library of National Medicine. But when Madison met Szot at an SMA conference in Los Angeles two years ago, her world opened up in a way she had always hoped, but wasn’t sure was possible. 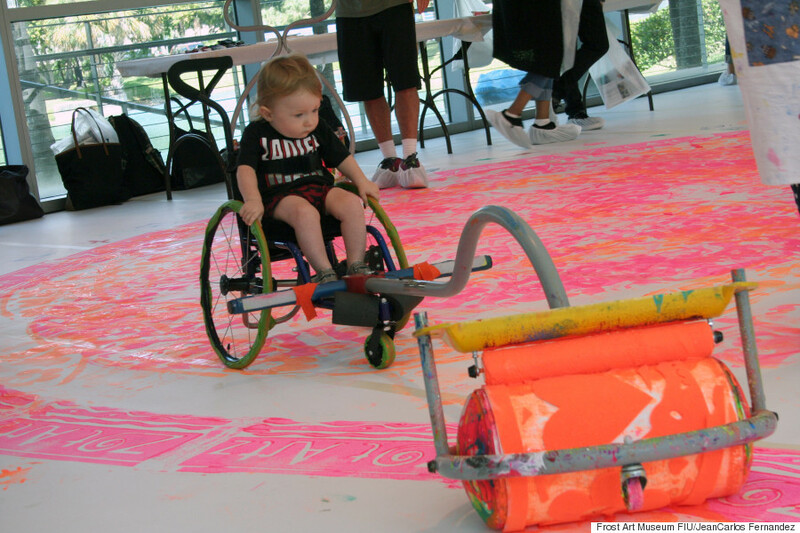 Since the late 1980s, when Szot unveiled the first edition of his painting wheelchair, the artist has spent his days building upon his current inventions and developing new ways to engage with kids with limited physical ability. Szot knew from the time he was a child in the foster system in the Midwest that he would pursue a career in art. But it was one that wouldn’t involve fame or fortune. Szot was particularly inspired by his foster siblings with disabilities, and how they adapted together to make their everyday routine work. He recalled how he and the other kids were always late for the school bus. To help his sister with cerebral palsy get there just a bit faster, he started dragging her along in a wagon. It was those childhood experiences, and simple adaptations, that inform his work today. Szot, for example, first developed his art roller with a National Endowment for the Arts grant nearly 30 years ago. 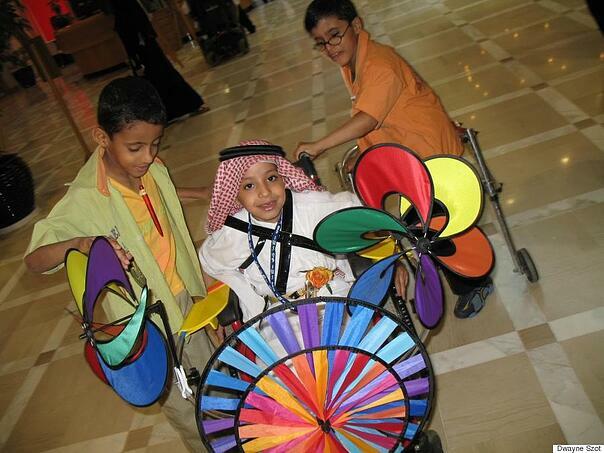 It involves attaching PVC pipe and a print plate to the base of a walker or a wheelchair. After it’s filled up with paint, the user just rolls and can create a massive mural. He uses similar technology for the Walk Chalk and Roll, which allows kids in wheelchairs to draw on the sidewalk with chalk. When he’s not toiling in his workshop, Szot takes his tools on the road, both around the U.S. and abroad, to show children with a range of conditions that they no longer need to live their lives as bystanders. Szot’s inventions have taken him as far as Saudi Arabia and Mexico. But this year, his workshops are all based in the U.S. He’s making stops in Detroit, Chicago and Portland, Maine, among other major cities. This past spring, Szot set up shop at the Patricia & Phillip Frost Art Museum at Florida International University, which allowed Madison to reconnect with the man who changed her life on her own turf. 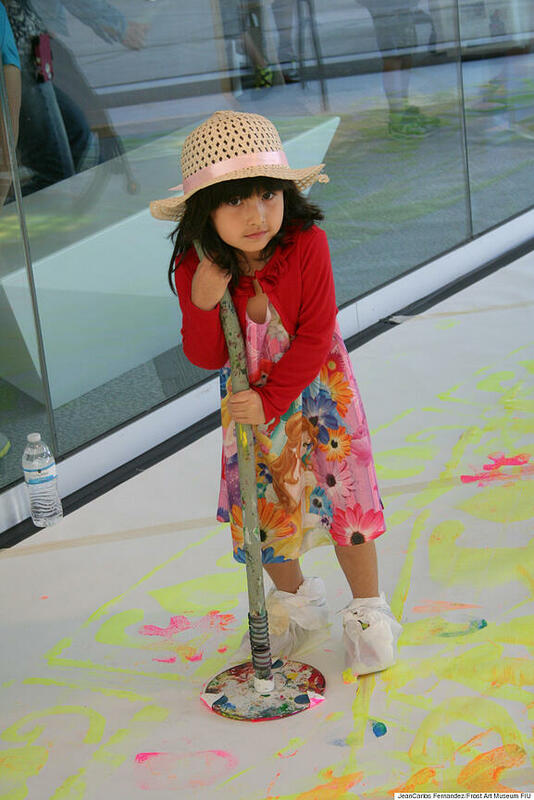 Together with Miami-Dade Department of Cultural Affairs, the Children's Trust and All Kids Included, the event invited 200 kids, both those with disabilities and without, to play together using Szot’s tools. For parents, participants and museum staff seeing Szot’s work for the first time, the experience was eye-opening. Newly diagnosed families that are just beginning to grasp what their children’s conditions mean for the long term felt particularly hopeful. Kaden, 14 months old, was diagnosed with SMA about half a year ago. He’s never crawled or rolled over and will never walk. Just playing with a toy is a challenge for him since he has to use nearly every muscle to prop himself up and keep himself from falling over, his mom, Katie Myers, said. But after watching Kaden spend the afternoon painting murals and playing with an adaptive kite, Myers said she felt reassured about her baby’s prospects.